Henry Darger and his big ol’ book, The Story of the Vivian Girls, in What Is Known as the Realms of the Unreal, of the Glandeco-Angelinnian War Storm, Caused by the Child Slave Rebellion, weren’t much of an inspiration to Vivian Girls. The Brooklyn-based, all-female power trio’s two-minute songs, actually, are in the realm of creative works, a stark contrast to the outsider artist and novelist Darger’s lengthy tome, which numbers 15,145 pages. Vivian Girls just liked the name. I knew that going into my interview with Kickball Katy, the band’s bass player. She’s heard the question many times from journalists who think they’ve struck research gold in the etymological origin of her band’s moniker. Never mind the music; every rock scribe gets the same album from the band’s PR flack. We want a story, lest we again resort to recitations of influences heard and inferred, and a back-story anyone can get from the band’s Website or MySpace page. So, forgive me if I dig. There’s as much merit to the question as the answer. Darger’s influence permeates popular culture; he’s been referenced in a book by Mary-Kate Olsen, a Natalie Merchant song, and an episode of The Simpsons. Lately, he pops up like a Whac-a-Mole in Vivian Girls’ turf: indie rock. Trail of Dead, Sufjan Stevens and Tilly & the Wall are just a few of the bands who’ve been moved by Darger’s mysterious image and work. 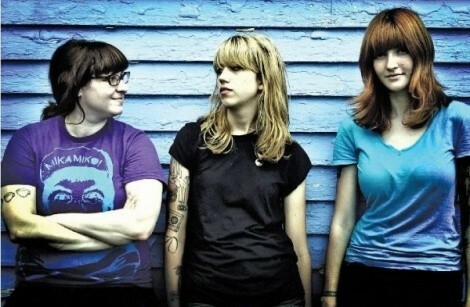 Vivian Girls are a smart band—all three members graduated college. Katy’s degree is in physics and education, guitarist/vocalist Cassie Ramone’s is in German, and drummer Ali Koehler, illustration. It’s no stretch to imagine they’d have something to say about him. That’s what we should be talking about, right? Vivian Girls wouldn’t be on the phone with City Weekly unless they were trying to pump up the fan base, get people into the club they’re playing tonight in Anytown, USA. Why get hung up on the name? Like I said, it’s a possible hook. We wouldn’t be on the phone together if we weren’t trying to get to know the band that makes this music Pitchfork deigns to rate an 8.5 and that my day job Blurt puts on the cover of our debut issue. How many different ways can you describe the music anyway? It could be as simple as Katy’s explanation for the Girls’ name. Adjective, adjective, reference, reference, influence, influence, reverb, done. There’s not much story to the band, either—at least not one that doesn’t seem like a template for a few other band bios. They met, formed, recorded a demo, played with acts like Jay Reatard and King Khan, released a limited run of their eponymous debut album on a teeny label (Mauled by Tigers), it sold out, they got signed to a different teeny label with an ounce more gravitas (In the Red). The music press got fired up about ’em; here we are. Whuzzat? Don’t sound so “fired up?” Katy, due to morning malaise or rocker’s ennui, wasn’t either. But she tried—and this isn’t a complaint, or nyah-nyah gotcha journalism. It’s an observation. You see, bands do press because they have to get to know their fans; it’s how you play the game (and it is a game). It means talking about themselves, even addressing the minutiae, in 10- to 20-minute increments with as many journalists who wanna talk to them. It’d be nice to confine the conversation to the music, but if a band is gonna be as laconic about their name, they’ll probably be likewise terse with other questions. That is, if there’s much else to talk about. In fairness, Vivian Girls isn’t alone in the non-interview realm. Guys like Mark Lanegan and J Mascis are famous for their non-answers. And I could have asked Katy more about the music and less about Darger, but I didn’t utterly neglect the former. The music, incidentally, is short, punchy, redolent of a jangly Nirvana and a punkier Feelies, and takes cues from the ’60s sounds of Phil Spector and the Shangri-Las—with a metric ton of reverb. And the songs are mostly about love—a topic Katy simply calls, “Very relatable.” And it’s good. Saturday May 2, 7:30 p.m.